In this era of present globalization, garments sector is playing its important role to keep the people moving with the movement of the modern technology. The implementation of mechanization in garment has ensured the financial accuracy and swiftness. It has made garments activities speeder, easy and comfortable. Garments in Bangladesh constitute the economic infrastructure in the country. Garments Business is like all other profit oriented business. It depends mainly on how much profit they can make; profit is the yardstick for the garment to move on garments business that deals with money and production. It gives me immense pleasure that during my internship period, as part of the MBA program, I have an opportunity of spending a period of 3 months with a reputable RMG Group where I observed and learned the garments operations. I am very lucky that Cottonfield gives me opportunity to work as an intern. Cottonfield has world wide network through which they provide a comprehensive services to their buyer. Relationship with the buyer is top most priority of the Cottonfield. This report mainly focused on Merchandising. the report is mainly divided into eight chapter. Chapter one is introductory part of the report. In the chapter origin of the report, background of the report, objective of the study, methodology of the study. Chapter two is overview of Mondol Group. In this part historical background of Cottonfield, structure and management, various department of Cottonfield is described. In chapter three described about merchandising of Cottonfield. Here discuses about order procedure for a buyer, job responsibilities of assistant merchandiser, calculating the fabric consumption for a basic T – shirt, calculating the costing of a basic T – shirt. Chapter four is analysis and comparisons. In this part Strength, Weakness, Opportunity and Threat (SWOT) is analyzed of Cottonfield compare with other garments. Growth of knitwear industry and how it can be growth is analyzed in this segment. In chapter five described about conclusion. If the knitwear sector continues to grow in the present manner ,it is likely to come up as major export earner of the country. Moreover the growth is likely to support the backward linkage industries like textiles and the dyeing industries. A combined effort is needed from the private sector as well as the government to keep up the trend in the global competition. Northern University Bangladesh one of the reputed private universities in Bangladesh, has designed the curriculum of the MBA course such a way that the international standard graduates will be produced. After completing 63 credit hours, one student needs to go for further 3 credit hours internship program in a commercial organization. Only 10 KM Zia International Airport. • Trial/ test cutting: The marker ratio of trial cutting should be different then bulk cutting. In trial cutting we should try to cut all sizes & minimum quantity. • Bulk cutting: We should not go for bulk cutting without approval of Q.C. department & pattern correction team. • Collect the order quantity along with color, size breakdown for style or P.O. • At the beginning of a season we received Design Pack. After that we have to Quote Price, which we have provide with Sample and Open Costing formet. • Next we received Order Confirmation messages from buyer with Excel chart & Confirm Sheet. • After received contract sheet we have to send for generate PO sheet. At that time we will receive PO and LC. • Later we have to send Fit Sample within 15 days. • And later on we submit Pre Production Sample after receiving the 1st Fit Sample approval. • Later we get Pre Production Sample approval, than we go to Bulk production. • After Bulk production, we send Shipment Sample to Buying House. • Learn about different counts of sewing threads. • Check export section when goods arrived in sea port in time. Weakness – Depend on imported raw materials, lack of knowledge. Threats – High price of raw materials, decrease of quota system. • Combination of modern technology. • A group of skilled and trained human resource with national and internal expertise. • Strong and Efficient management. • A strong linkage between the all companies. • Port of Chittagong is very slow in handling containers due to lack of cranes. • Low productivity of labor. • Dependent on 100% imported raw materials and technology. • Difficult to handle with always upgraded new technology. • Over dependence on imported raw materials. • Very higher quality product which have a good demand in international market. • Sub contracts from Canada. • Market for a large portion of product is ensured within the all companies of the sister concern of Mondol Group. • After full integration of the group, the administrative cost might be lower. • There is a good opportunity for marketing, more production in future. • Very competitive national and international market. • Many new companies are coming in front with new product and new technology. • Dependency of foreign countries for raw materials. • National and international yarn market is always fluctuating. • Cottonfield has a modern technology, efficient and dynamic management & commitment to the highest work standards. • There are clear structure and accountabilities supported by well understood policies and procedures to guide the activities of the factory’s management both in its day-to-day business in the areas associated with internal control. 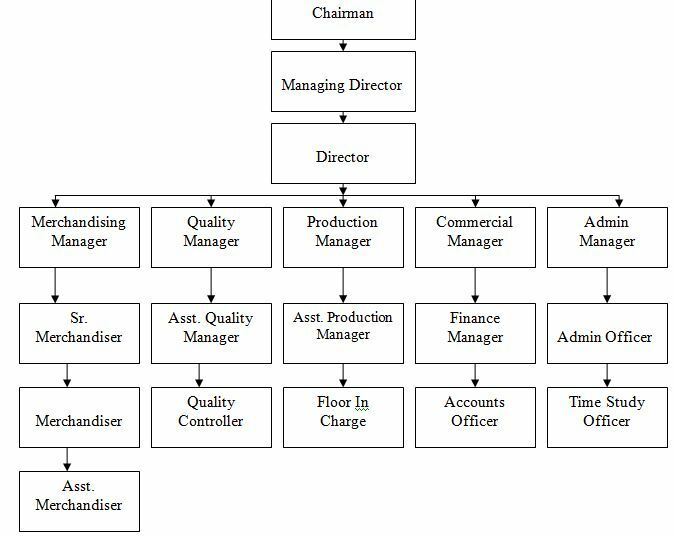 • The factory is operating through a well defined management structure headed by Managing Director under whom there are various department heads and according to hierarchy, various senior mid level management staffs. The Managing Director and departmental heads meet at regular interval. • The factory always recognizes the importance of human resource development and makes considerable investment for acquisition, development and retention of talented and dynamic professionals through its programs for trainings, allocation of responsibilities & authority, performance appraisal, job enlargement & enrichment.